The transition phase we are going through, passing from a unipolar global order to a multipolar one, calls for careful observation. It is important to analyze the actions taken by two world powers, China and Russia, in defending and consolidating their sovereignty over the long term. Observing decisions taken by these two countries in recent years, we can discern a twofold strategy. One is economic, the other purely military. In both cases we observe strong cooperation between Moscow and Beijing. The merit of this alliance is paradoxically attributed to the attitude of various US administrations, from George Bush Senior through to Obama. The special relationship between Moscow and Beijing has been forged by a shared experience of Washington’s pressure over the last 25 years. Their shared mission now seems to be to contain the US’s declining imperial power and to shepherd the world from a unipolar world order, with Washington at the center of international relations, to a multipolar world order, with at least three global powers playing a major role in international relations. 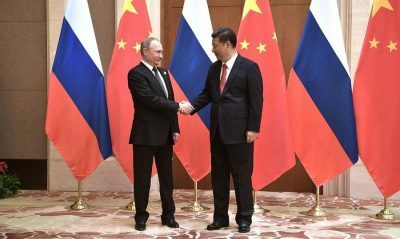 The Sino-Russian strategy has shown itself over the last two decades to consist of two parts: economic clout on the one hand, and military strength on the other, the latter to ward off reckless American behavior. Both Eurasian powers have their respective strengths and weaknesses in this regard. If Russia’s economy can hardly be compared to China’s, China plays second fiddle to Russia’s conventional and nuclear deterrents, and is quite some way behind Moscow in terms of hypersonic weapons. The cooperation between Moscow and Beijing aims to synergize their respective strengths. I have written about this in the past, noting that Russia and China have implemented complex and advanced systems in recent years to close the technological gap with the West, Moscow being at least equal to Washington in this regard, and sharing with Beijing some of its most important innovations. The sale of S-400s to China paves the way for a future joint defense of Eurasian airspace. As the process of union and cooperation between the two countries increases, their respective militaries will have the task of discouraging outside attempts to destabilize the region. This is the reason why the United States sees the sale of the S-400 systems (to Turkey, for example) as a red line not to be crossed. The ability to prevent access to one’s airspace upsets one of Washington’s principal doctrines of war. Without air supremacy and the ability to operate in an uncontested airspace, the American way of war is severely hobbled, it becoming practically impossible for the United States to impose its will militarily. In the same way that de-dollarization represents an economic nuclear weapon in the hands of Russia and China, the development of hypersonic weapons is the linchpin of the Sino-Russian alliance’s ability to defend its territorial sovereignty. I wrote two very detailed articles on these amazing weapons, and so did my colleagues at the Strategic Culture Foundation. It is an exciting topic because for the first time in years, Washington has faced the accomplished fact of its geopolitical adversary’s impressive technological progress. Hypersonic weapons have no present weaknesses, and Moscow is the only country in the world capable of producing and using them. With this new capability, the range of action of the Russian Federation reaches unprecedented levels. The challenge for Russia and China is complex and ongoing. The transition from a unipolar to a multipolar world order is occurring as we speak, enabled by economic and military sovereignty. The challenge for these two Eurasian countries will be to increase their military and economic power, and correct the obvious imbalances in the current world order, without destroying it.